My wife Monica and I were driving down a dirt track with our new-found Australian friends Martin Cohen and Julia Cooper chatting about the local herps. Martin said "the most common gecko around here is Bynoe's Gecko  you'll find a few under every piece of tin you come across." Just then we drove past a few discarded pieces of tin... you can guess the rest. 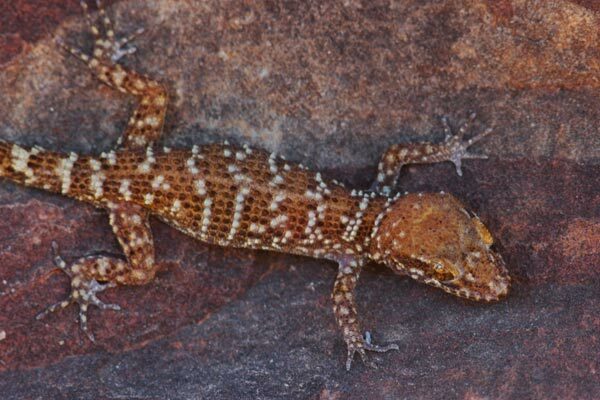 This bumpy little gecko was extremely common around Australia's west coast also. It was probably the most numerous reptile I saw there, though the Shingleback gave it competition in this category. 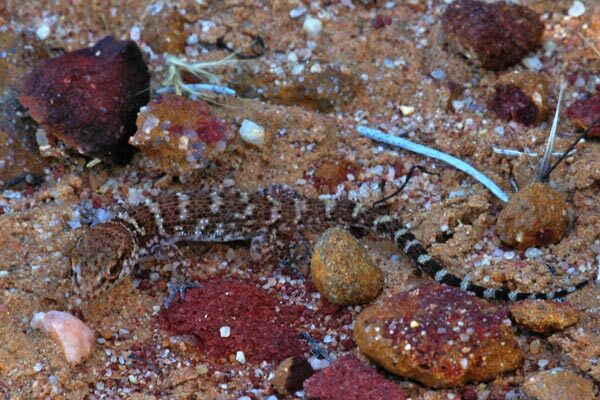 This one was lurking under a rock in an undeveloped area just across the street from the Kalbarri Palm Resort, where we were staying. 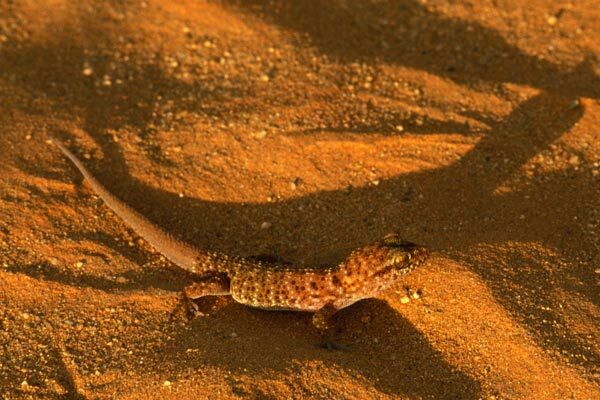 Bynoe's Gecko is widespread in Australia. Some researchers believe that it's really a complex of related species, but further studies would be needed to untangle the taxonomic situation. 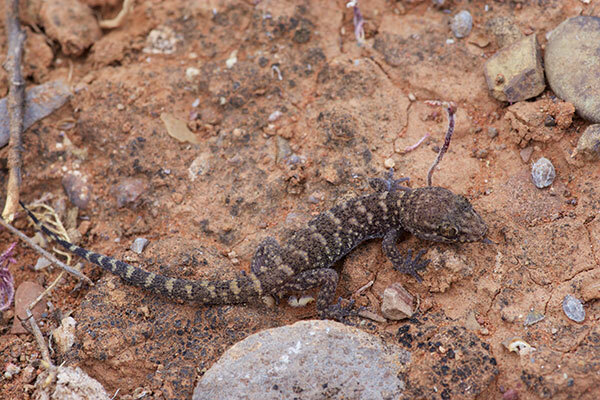 This one was under a flat rock near the Nature's Window formation in Kalbarri National Park. This is a tiny baby, with a total length of perhaps an inch and a half. It was under a board at the makeshift golf course on the outskirts of Denham. Many boards were scattered about here, and most of them harbored Bynoe's Geckos. 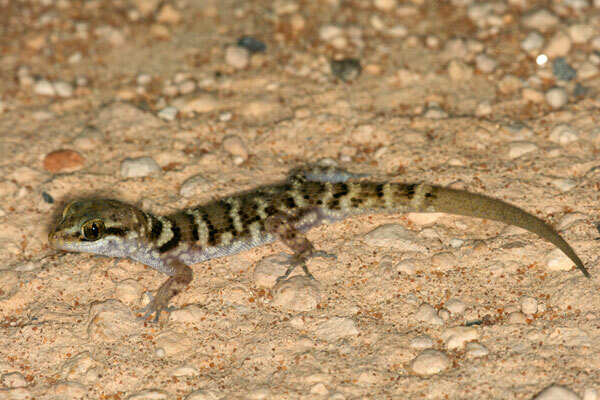 I also found one other type of gecko sharing the same type of accommodations, a Variegated Dtella. 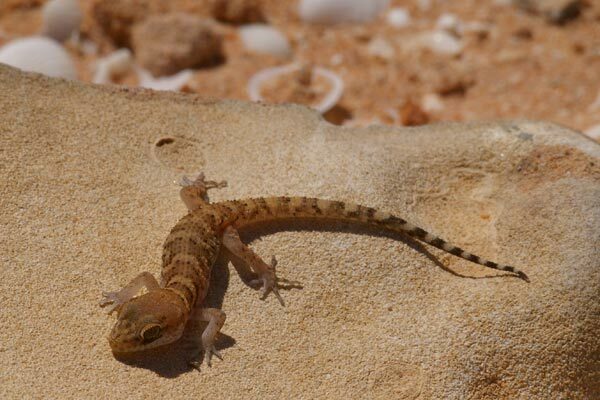 Most of the Bynoes Geckos Ive seen were under boards or rocks or sheets of tin during the day, and I had developed the impression that they were diurnal. Not so! Here is one of the few that my sister Mary and I found on the road at night on this trip. 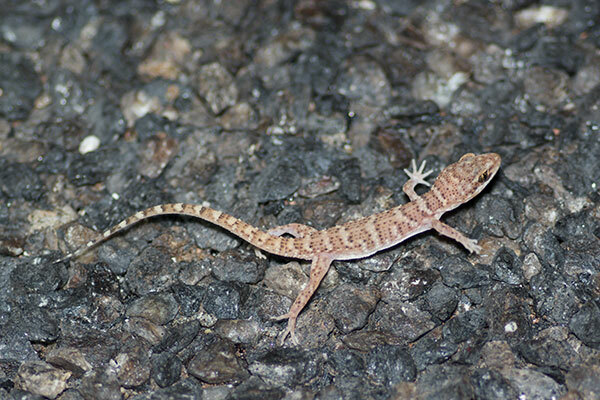 East of Alice Springs I was out snake- and gecko-hunting at night and found this very young lizard. 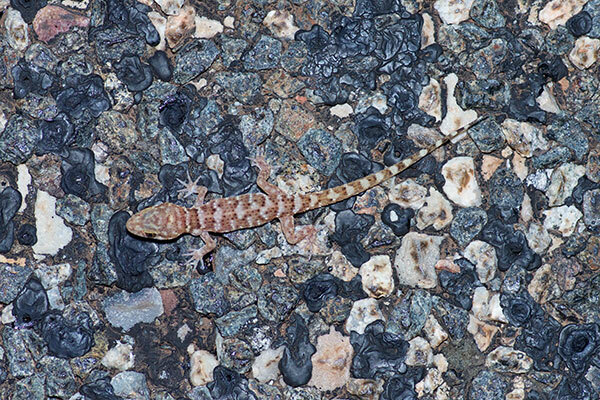 It moved much more quickly than the other species of road geckos in the area, sprinting from place to place while the others only jogged or walked. I don't know what the deal is with this crazy splayed position; this is the only moment where it stayed in place long enough for me to get a photo. This one was also a youngster, and sprinted from place to place on the road. But at least it stopped in a normal position. I had been chasing a skink around when it scurried under a small log. When I lifted the log, the skink shot out to another nearby object under which to hide, and this gecko looked up at me in surprise that its cover had been blown.